I like liked chow.com. That they were somehow connected to the evil, ill-tempered, non-transparent, repetitive, bullyish juggernaut that is Chowhound, I pushed to the back of my mind, clearing me to enjoy Chow.com for its cocktail coverage, sometimes quirky food-related subject matter and for its blog, The Grinder. I am pretty sure I am in the minority of people who liked Chow.com. Before this even happened I had been hearing stories of them editing butchering copy and upsetting writers, so I am not sure I would have stuck with them much longer anyway. But now that Chowhound are crawling over Chow's face like a bad rash, I think I will wean myself off the whole mess for good. The funny thing is those on the other side of the fence - the Chowhounders - are much more upset than I am. They are mouthing off all over the place. CNET has got some work to do, to calm this lot down. Fight, fight! 2005 | Ways not to make Mayo, period! Hah! I know so many of the different participants in this debacle. (People at CNet, consultants involved in the merger, chowhound nuts, chow fans and a host of big time haters) that it is hard to have perspective but since I never liked Chow or chowhound very much it is hard for me to care all that much either. I go back to what I always said - I get better written, more knowledgeable, funnier, livelier and more personally connected information from food blogs. Like yours. you are so funny...thank you for the laugh du jour. You are absolutely hysterical!! I will take a little stroll over there myself... goodness me but do we have the makings of a serious food fight on our hands! I'm genuinely surprised that they allow any dissent at all. The Chowhound I remember was so draconian with the censorship they made former Soviet Bloc oligarchies look like a Karen Finley yam performance. I have found it humorous that Jim Leff would say: "and the good guy restauranteurs had a spotlight shone on them." You mean like Sam's post on Delfina, Jim? I'm not thrilled about the new format either - I think I'll stay away for awhile and see if they make any changes for the better. I'm not a huge fan of Chowhound, but I do use it because I find it amusing to check for updates on posts that I contribute to (I never initiate them - it would be too much of a waste of time if they were deleted.) This new update has really done a number on the usability of the boards though - changing and getting rid of features that seemed much more functional than the current format. It seems clear that they would really like to just do away with the distinction between Chow and Chowhound (the Chowhound logo now routes to the Chow homepage, for example) and I have a sneaking suspicion that they really don't care much about what the "haters" think. It's really more of an online magazine now, and the forums are an afterthought. You've made quite the cottage industry out of Chowhound bashing, haven't ya? Don't think we haven't searched Google for "Chowhound" to see why this is such an interesting topic for you to strangely care about so much. So it is not surprising that you jumped at this opportunity to "bash for traffic". But I think it is really lame that you took the pot shot at CHOW editorial- especially since you have no problem showing up to our parties, eating our food and drinking our wine. Just another attention starved blogger? That's just so dissappointing and sad. What, does CHOW (all caps) require all party guests to sign an oath of loyalty before serving them food and wine? Or is that just for the attention starved food bloggers? What's truly disappointing and sad, is that you feel the need to stoop to using insults in an attempt to intimidate someone who has written about your site on HER OWN BLOG - and then have the nerve to plant a link to your site in the comments! How repulsive. If you really do represent Chow or Chowhound, you should be fired for this. You have just made them look like huge a__holes to the entire audience of this blog. You've certainly gotten my attention, and I will do my part to make sure everyone within earshot hears about this ridiculousness. Thanks Alice. We appreciate the support on getting the word out. So here's the deal... our friend Sam has friends that work for us. That's why she's been invited to our parties. She also has a lot of fans of her blog that work for us, as we point to her quite often. We have no problem with her or any person making comments on our product, business methodologies or general issues with our taste in web site colors. All that is fair game, and she has done it before without comment from us. But when you throw out personal pot shots about butchering editorial, etc, we take issue with that. And we are not a blog that can throw out our personal agendas when we feel like it, so this is the only forum to respond as I guess Sam prefers this over the email, IM or phone. Besides, I believe the instructions were "fight, fight"... right? So we're game. Let's have an honest conversation about the problems you see with our business. Again, we're fans, so we'll listen (the reason for the link back to the site, which kind makes that point). Remember, Sam's smart. This little flair up only sends more people her way- otherwise why do it? She does quite well talking about food most of the time- not web business strategies, editorial methods and design. Again, I think we are just so bothered that it was personal- especially when the livelihood of her friends were involved. I guess it just hurts when your "friends" pick on you for something as silly as web traffic or blog notoriety. Are we really jerks for being hurt by that? I think B&P is far better than chow! 1. anyone who visits the circuit of food blogs saw that chow made changes to their website. 2. anyone who visits the circuit of food blogs also so that other places commented about this change. what's the big deal? anyway, you obviously sound like you work for cnet, and here you are sounding off and looking like a 5th grader. when you have a website, especially one that has a bunch of users, you cannot expect to please everyone. some people are going to HATE some of your UI, design, js widgets and the like. deal with it man. grow up. we're not here to butter your bread. as for monetizing blogging traffic... that's what every smart blogger should do. who the hell are you to complain about that when your paycheck is paid by advertisement? as long as you admit to being a hypocrite, then ok. otherwise, sounds like the pot calling the kettle black. you are NOT game. if you really are game, post a front page story on chow and chowhound. and we can go toe to toe there. you're hiding behind this blog's comment board. you wanna go? go on your own website, see the kinda nefarious attention you'll get for lashing out at a blogger. leeeet's goooo. i'm so ready to see this. I loved Chow.com and think I said as much on my blog. I loved The Grinder and definitely said as much on my blog. No doubt, I sent Chow.com traffic, dare I say it - probably more than Chow sent me, I don't really think or sweat too much about that myself, but since you made it an issue let's get that out in the open. Please be clear I do not need traffic which is only necessary for monetarization purposes. Since my blog has no advertising, traffic is not an issue for me. Perhaps those who rely on traffic do think long and hard about how they are going to create popular posts that will have a high google ranking, but I don't do that. I am just writing about what is on my mind on any given day. I must really take issue that you think this is the reason I wrote that post. The chow changes were a topical subject yesterday and that is why I wrote about it. I didn't wake up in the morning and think "Oh I need a post with high google ranking so let me write about chowhound today". What would be the point - I already I had the #2 google spot for a 'chowhound' search anyway. To be quite honest, more of the world cares about searching for 'how to trim an artichoke' than they do for 'chowhound'. I didn't know why I received a party invitation to Chow but I was very honoured to have done so at the time and I enjoyed myself immensely. It's true I am a little disappointed to find out I got the invite only because I had friends who worked there, I naively assumed it was because the team liked my blog or something but you live and learn. Obviously I have a lot to learn. At the time of the invite I loved meeting Davina who I think was doing a stellar job with Chow.com. I really thought it was a refreshing approach to food. Fyi I actually was drinking Hangar One's cocktails at that event, not 'your wine' as you put it. Were they sponsors or did Chow actually pay for the drinks? Also to field your accusations further, just so you know, I am one of the few bloggers that does actually have a problem with accepting free invites to such events but I won't bore you with the details of my inner turmoils here. I was in the minority that voted for Chow.com as best non-blog food site in the food blog awards. Yes, I actually liked it that much. 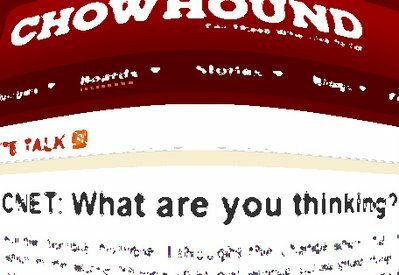 The main upset for me yesterday was that I woke up to find that the only website (Chowhound) that I refuse to visit on a matter of principal was plastered all over my favourite non-blog food site (Chow). Can you imagine how much that hurt? When people are hurt, they sometimes say things that they later regret. Nothing I said above isn't true, but there is one thing I said in the post that I regret having said. It wasn't necessary of me to take that shot. I would like to apologize to Davina for that. I don't want to make a big deal about what I am apologizing for, because I am sure it is an issue that doesn't need anymore bad publicity than it's already got. Davina will know what it it is. PS. "MT" is set to do more damage to Chow's reputation in the writing of these comments than I ever could. I can't speak to the question of whether all of your co-workers are jerks, but you certainly are for taking these unbelievably cheap pot shots. If there was something more behind your response, you should have corresponded with Sam privately before airing your grievances with all the finesse of a five year old. I can't believe you are still sticking to the argument that Sam is "picking on you" for web traffic or notoriety. In fact, I'm starting to think it's actually the other way around. Yes, let me jump on Sam's bandwagon and say that MT's snarky and juvenile remarks really does more to hurt the reputation of Chow than anything Sam has written, posted, said, telepathically transmitted, text-messaged, you name it. Even with the criticism I personally have levelled against Chowhound (hmmm, Chowhound Bashing? Maybe), I had at least some respect for Chow. Actually, I loved that tutorial on homemade pancetta you guys did. Now - not so sure. I'll be fair minded and not assume MT solely speaks for Chow, but I'm thankful for Sam's "reporting" on the subject because while Chowhound remains a sore spot for me personally (and apparently, not just me), it's still a subject I'm interested in. MT, think: comfort food. As we progress from the hearty soups and stews and roasted root vegetables of winter time, let's liven up our plates with lots of fresh greens wilted with hot bacon grease, vinegar, and sugar. Think Springtime, renewal, regrowth, newness. First, let me apologize. Yesterday was a tough day, obviously, and I read your comments not as commentary on the changes, but as a personal affront to the people who work here. I guess I should have also clarified that I do work for CNET/CHOW, as I thought that was implied in the link, tone and defense. Again, we are huge fans of you and your site. I said that in the original post, and it remains true today. You do an amazing job, which is why we read you. More important, we know your ethics and standards are beyond reproach, so that is why I took the attacks personally. I’m not proud of the way I responded, but I will not apologize for defending my team and the tremendous job they do each and every day. Many of the issues with yesterday’s rollout, and there were MANY, are being resolved. I would like to understand in more detail your issue with Chowhound being on Chow too. I understand some of the moderation issues you have had and discussed in the past, but don’t you think there is still some value in the tips being traded on Chowhound? We thought the CHOW readers (fewer of them than Chowhounds, but still...) would be interested in some of the latest threads over in Chowhound. This may or may not be the case, but we are still young enough as a site to try new things. Literally, every person on my team (who I thought I was defending!) has told me that I was a jerk. I get it, and I hope you will accept my apology. Woo, this has been an interesting one to follow -- and now that Mike (that's MT to you) has made amends, I wanted to step in as a not-so-hotheaded voice on the editorial side. It's always hard to see your work criticized, and as Mike said, yesterday was hard -- there was lots of criticism on Chowhound and elsewhere, lots of it valid. I'm pretty thick-skinned, but I still don't like to see CHOW slagged and discounted. As of today, lots of changes have been made on the Chowhound boards. We'll be evaluating the CHOW front page, and figuring out design and interface tweaks. As for CHOW's editorial content, we're continuing to do what we do with an amazing team, and some people will love it and others won't. Thanks for your apology, Sam. I will buy you a cocktail next time I see you (soon, I hope), not because I think it will get us good coverage, but because I like you. - Having more, differing voices are a good thing and should be applauded, not chastised. - It's really no surprise Chow and Chowhound are now sharing web space. They've been sharing staff for a long time now. I'd like to see CNET get it right, give 'em a chance and i think they will. And I love your site, keep up the fantastic work! I don't have access to blogger during the day at work, so I just saw the latest. I have no doubt that the last few days have been stressful for the people at CNET and Chowhound. We all make mistakes, and I'm glad to see the apology - I will update my post accordingly. Thanks for the heads up! I used to like Chowhound quite a bit but the mysterious deletion of posts without explanation really turned me off. In "Designing the Obvious: A Common Sense Approach to Web Application Design," Robert Hoekman Jr. makes the following point. "Understand your users, then ignore them." Meaning that web designers should understand what their users need, not that they say they need. The difference is subtle but important. The CHOW/Chowhound site merger seems to be an attempt to address usability issues for the greatest number of their visitors. As a veteran of both the online video game and the web application industries, I can say from experience that major product changes are always met with pushback from highly engaged users. The true test of whether or not the CHOW/Chowhound site designers have properly anticipated the needs of their users will be seeing whether these users are still registering the same fervent complaints a month from now. Sam makes some very good points here from the perspective of a veteran CHOW reader. My issues with the Chowhound moderators is well-known and documented. However, in this case, I have to advise that we all cut the developers some slack. I've been there in those same trenches. New design roll-outs are never smooth. Measure twice and cut once rarely works as well as it should. What matters now is how the CHOW/Chowhound design team responds to user feedback in streamlining the new site. As for MT's response to this post, I'm a senior manager at a large web application development firm that's posted about on tech blogs like TechCrunch (a fairly close analogy for this situation). If I'd seen one of our customer service reps pull the same sort of stunt on TechCrunch, I'd be calling up his supervisor to have him fired. Period. Apology or no apology, this wasn't the conduct of a professional, and reflected poorly on CHOW/Chowhound. In my opinion, it's indicative of the same level of peevish amateurishness that infects the Chowhound moderators, and yet another sign of how much their customer service process still has to mature. If the mods would just post these, there would be a lot less hostility. I completely understand why SF bloggers have a backlashed against Chowhound. You're accustomed to having complete control over your content. Why sacrifice that control when you already have an outlet for your opinions? Why utilize an outlet that places restrictions on content when you already own an unrestricted outlet? Chowhound is for the rest of us; those who do not have the time/money/energy/whatever to maintain a food blog. For these people, it is a wonderful tool to share opinions, write reviews, provide advice, and seek recommendations. Yes, our content may be deleted or moved from time to time (though once you learn to play by the secret rules, this stop happening. Enforcement is inconsistent, but the rules are not arbitrary). But that's a small price to pay to have our own forum, maintained by an outside entity, completely free of charge. I don't look at the issue as Bloggers VS. Chowhound. I enjoy reading blogs, I enjoy using Chowhound. Despite Chowhounds strict moderation and corporate ownership, there is a lot of valuable content on the boards. The mods don't write the reviews, the users do, and the users' input is priceless. I noticed that many of your readers prefer to lurk on Chowhound, instead of posting. That way, they can access the valuable content without getting upset with moderation policies. This seems like a good compromise. If I'm looking to try a new restaurant, I'll use all of the resources I have: blogs, Chowhound, eGullet, Zagat, SFGate.com, The SF Food Lovers Guide, etc. More information is never a bad thing, as long as you know how to evaluate the information. As for your current dilemma, I don't understand how the existence of Chowhound diminishes your ability to enjoy Chow. If you don't want to use Chowhound, don't click on it. The stream of backlash from veteran Chowhounds has turned into a trickle, now that the early bugs are fixed. People will always be hostile to change, even when the change is good. I love the new board design, and I think it will be the most functional version of Chowhound to date (as soon as the search feature is complete). I'm posting as anonymous, because I don't know how CNET will respond to the Secret Rules link. And yes, I understand the contradiction in advocating for Chowhound, while hiding my identity out of fear of the moderators. chow have atually moved the chowhound links to the bottom of their front page I just noticed so maybe I will return for some chow reading afterall. Having had Jim Leff invade the privacy of my personal email adress, uninvited (he only had my address because I gave a donation to Chowhound and naively I assumed when you give a donation your email is somewhat onfidential, apparently not) to preach and patronize me, you will forgive me for having been somewhat burnt and somewhat hurt by him, and somewhat keen to NOT see the contents of his pet project splattered all over a site with great potential like CHOW. Keeping up with their theme of draconian censorship, you'll notice that the dissenting posts you linked to have now been removed. I love food and lively discussions about it, but this just creeps me out. Chowhound has lost me as a user. I now join those who have had posts summarily and arbitrarily deleted with no explanation and my membership banned because I dared to disagree with the moderators. And here I thought the 21st century wouldn't be subject to heavy booted censorship tactics. I'm through with Chowhound forever. Too many arbitrary deletions. The moderators are just arrogant, and I don't need the site anymore with the excellent blogs that are out there. Google is my friend.